“One day,” wrote Grace Paley, “I decided to not grow any older / lots of luck I said to myself.” (“One Day I Decided”) With her humor, enthusiasm, and activism, Grace has not grown older. With her wisdom, she has. I first wrote about Grace thirty-some years ago in a paper for one of the early women-run panels at the Modern Language Association. My paper was “The Dirty Ladies,” which included the now-elderly Erica Jong, Lynda Schor, and Grace Paley, three women with salty tongues. When I missed seeing Grace, I would stroll down Sixth Avenue on Saturdays to 11th Street, where she and her sister activists, her “affinity group,” set up a card table with petitions to sign and information to distribute. News, friendship, and laughter overloaded the wobbly table. We celebrated birthdays. Grace’s were street-long affairs, with stiff stilt walkers and musicians making merry. At her sixty-fifth birthday, held as a benefit for the War Resisters League, her files were recovered from the state and FBI undercover intelligence agencies. They were read aloud. The “perp” to the agency, the disturber of the peace, the trespasser, was our heroine. We applauded each act of disobedience. Grace and I often drove together to teach at Sarah Lawrence. We would speak intensely on those two days. The first was devoted to religion, in which my interest was greater than hers, and the second to politics, where her activism exceeded mine. We each persuaded the other. Grace does not shy away from describing the physicality of aging. “You know what the worst is?” she informed me. “Your hair thins.” She’s been sporting a navy tam. I feared for Grace’s art when she left the West Village, the setting for her poetic urban voice. She has been in Vermont for decades now, returning to visit New York and her family every several months. I am comforted. Wherever Grace lives, she sets down roots and finds an affinity group. But I still find myself looking for the newsy, noisy card table on Sixth Avenue. 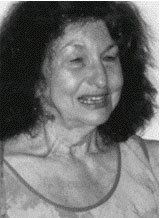 E.M. Broner is the author of ten books, including A Weave of Women. She is Professor Emerita from Wayne State University, and has taught at Sarah Lawrence College and Haifa University. Her short fiction has appeared in Mother Jones; Tikkun; Ms., Epoch, and Ploughshares. She has written articles for The Nation and Women’s Review of Books. She has received awards from the National Endowment for the Arts; the Wonder Woman Foundation; the Borough of Manhattan; and Wayne State University. Several film documentaries have featured her, including Half the Kingdom; Miriam’s Daughters Now; and Illuminating the Unwritten Scroll. She has been friends with Grace Paley for many decades. View More: Next piece "Ten Poems", Home, Archive.